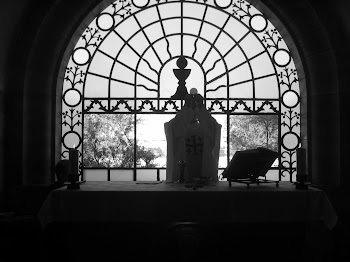 Living Sacrifice: Bartimaeus and "Living the Catholic Faith"
Bartimaeus and "Living the Catholic Faith"
We began our Fall Book Club again a few weeks ago, and this season we are discussing Archbishop Charles Chaput’s book Living the Catholic Faith: Rediscovering the basics. As the title suggests, the book explores the fundamentals of what it means to live the Christian life. The first is conversion. Think about the very first words of Christ when He begins His public ministry: “This is the time of fulfillment. The kingdom of God is at hand. Repent, and believe in the Gospel” (Mark 2:15). So the first requirement is to turn from sin and be faithful to the Gospel. The second one flows from that: discipleship. We become disciples of Christ, walking with Him in our daily lives. And finally, as we experience that ongoing conversion and continue to walk with Christ as His disciples, we encounter the third requirement for the Christian: transformation. Our lives become transformed as we become more and more like Christ, in the way we talk, the way we act toward others, the way we vote (especially important for us to remember with elections right around the corner). In other words, we are transformed to be Christians not in name only, but in the way we live our lives. 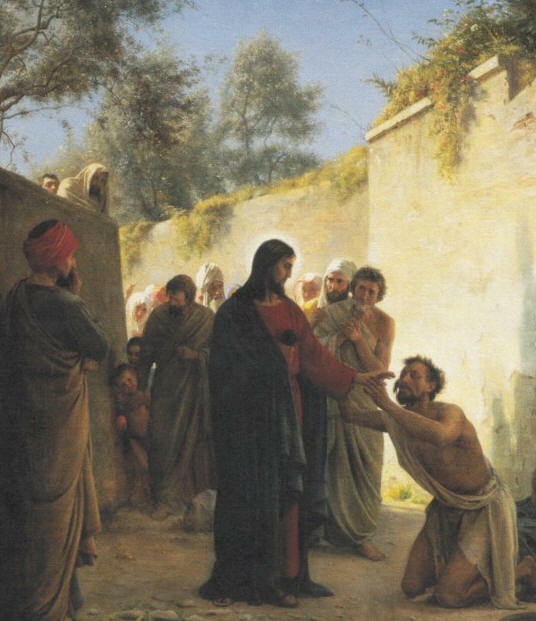 In our Gospel this morning, we see those three requirements—conversion, discipleship, and transformation—in a profound and beautiful way in the life of the blind beggar, Bartimaeus. As our Gospel narrative begins, we find Bartimaeus in the very same place each of us would be in without Christ: blind and in the dark. That is here we would be, spiritually blind and lost without God. Now, make no mistake about it; Bartimaeus is able to get by. He is not stumbling around and bumping into things. He is able to provide for himself by begging for money in the streets of Jericho. But his life falls so far short of what it could be. He longs for so much more than what he has. Take courage; get up, Jesus is calling you. There we discover the very mystery of conversion. It is no longer the case that Bartimaeus is the one crying out. Now it is Jesus who is calling out to him. Long before we ever begin to call out to God—for grace and strength, for help or healing—long before the prayer of faith is ever on our lips, God Himself is already calling out to us. He is calling out to each one of us right now, calling us to a deeper conversion of heart and a renewed commitment to turn away from sin, and be faithful to the Gospel. Bartimaeus recognizes that call and he responds immediately. St. Mark tells us “he threw aside his cloak, sprang up, and came to Jesus” (Mark 10:50). What an odd description. He threw aside his cloak. Why did he do that? Some of the Fathers of the Church comment on this passage and say that he is throwing off the old self, and putting on Christ (as St. Paul describes in the New Testament). He is getting rid of the old way of doing things, the old Bartimaeus, and getting ready to begin a whole new life with Christ. In the early Church, when people were baptized, they were often fully immersed in the life giving waters of rebirth. They would remove their garments completely and enter fully into the water—dying with Christ in baptism—only to emerge a new creature. They would put on a new, white garment as a sign that they had put their old, sinful ways behind and had now put on Christ. Today God challenges each of us, as baptized Christians, to throw aside whatever sins are keeping us from living a full life in Him. We are called to throw aside our old self, and put on Christ, even as we were clothed with that white garment at our own baptism. But more than that; being a Christian involves more than just avoiding evil. We are also called to do the good. We are called not just to let go of bad things, but even to sacrifice good things in order to follow Christ more closely. St. Jose Maria Escrivá comments on this scene, where Bartimaeus throws aside his cloak and goes to Christ, and says it is a representation for the sacrifice we are all called to as disciples of Christ. Escrivá describes a time in his life when he had come upon a battlefield just after a major campaign (Election Year pun intended) had been fought. He described how the entire field was literally covered in army coats that the soldiers had abandoned—thrown aside, like Bartimaeus—as the battle raged on. There were also water bottles; sacks filled with personal items like pictures or letters from loved ones. All of these items had been left behind by the victors, those who had won the fight! They were willing to sacrifice even those good things in order to win the victory that day. How much more willing should we be to make sacrifices in our lives to win the victory for Christ? And so, as Bartimaeus experiences his conversion and comes to Christ, we are told “Immediately he received his sight and followed [Christ] on the way” (Mark 10:52). This week, how is God calling us to experience conversion, discipleship, and transformation? Where is God calling us, in the midst of our own lives and experience, to be disciples who are transformed and immersed in the mystery of Christ? This morning Jesus comes to us in the Eucharist and gives us the grace and strength to encounter Him in a whole new way. God opens our eyes, like He did with Bartimaeus. But more than that, He opens our hearts and gives us everything we need to “follow him on the way” in our own lives this week.